Plone Wiki behaviour overview. How to enable wiki behaviour on a Plone site. Plone Wiki behavior is an option that can be switched on for specified content types (pages, newsitems or events). Starting from version 3, Plone CMS has such wiki support added. Wiki support allows to use the wiki markup in Plone websites to create and link documents in any content. Plone wiki markup can be used on all existing documents, it has support for any type of content - plain text, any of the text-based markups, HTML. Plone wiki allows you to get the benefits of the quick and easy wiki content generation and linking, housed in a world-class content management system with proper access controls and the multitude of features exclusive to Plone. 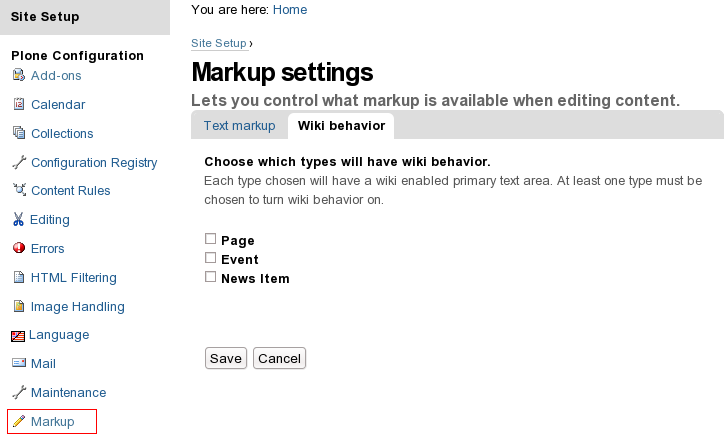 Wiki-style markup is not enabled by default in Plone. To enable it, go to the Plone Control Panel (via the Site Setup) and click Markup. From there you can configure "Wiki behavior" by selecting from the three possible content types (Pages, News Items and Events).